HOW TO USE: Read the Medication Guide available from your pharmacist before you start using phenelzine and each time you get a refill. If you have any questions, consult your doctor or pharmacist. Take this medication by mouth, usually 1 to 3 times a day as directed by your doctor. This medication may be taken with or without food. Dosage is based on your medical condition and response to therapy. To reduce your risk of side effects, your doctor may start you at a low dose and gradually increase your dose. Once your condition improves and you are better for a while, your doctor may work with you to reduce your regular dose. Follow your doctor's instructions carefully. Do not take more or less medication or take it more frequently than prescribed. Your condition will not improve any faster and your risk of side effects will increase. Use this medication regularly in order to get the most benefit from it. To help you remember, use it at the same time(s) each day. It may take several weeks for the full benefits of this medication to be noticed. Do not stop taking this medication without consulting your doctor. This medication may cause withdrawal reactions, especially if it has been used regularly for a long time or in high doses. In such cases, withdrawal symptoms (such as restlessness, confusion, hallucinations, headache, weakness, and diarrhea) may occur if you suddenly stop using this medication. To prevent withdrawal reactions, your doctor may reduce your dose gradually. Consult your doctor or pharmacist for more details, and report any withdrawal reactions immediately. Inform your doctor if your condition persists or worsens. SIDE EFFECTS: See also Warning section. Dizziness, drowsiness, tiredness, weakness, problems sleeping, constipation, and dry mouth may occur. If any of these effects persist or worsen, notify your doctor or pharmacist promptly. Remember that your doctor has prescribed this medication because he or she has judged that the benefit to you is greater than the risk of side effects. Many people using this medication do not have serious side effects. Tell your doctor immediately if any of these unlikely but serious side effects occur: fainting, mental/mood changes (e.g., agitation, confusion), muscle stiffness/twitching, changes in sexual ability/interest, shaking (tremor), shivering, swollen ankles/legs, unusual weight gain, vision changes (e.g., double/blurred vision). Tell your doctor immediately if any of these highly unlikely but very serious side effects occur: severe stomach/abdominal pain, persistent nausea/vomiting, seizures, dark urine, yellowing eyes/skin. 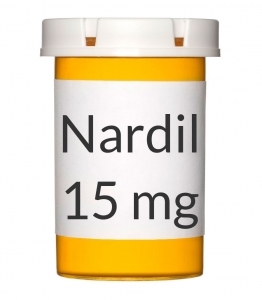 This drug may rarely cause an attack of extremely high blood pressure (hypertensive crisis), which may be fatal. Many drug and food interactions can increase this risk (See also Drug Interaction section.) Stop taking phenelzine and seek immediate medical attention if any of these serious side effects occur: frequent/severe headache, fast/slow/irregular/pounding heartbeat, chest pain, neck stiffness/soreness, severe nausea/vomiting, sweating/clammy skin (sometimes with fever), widened pupils, sudden sensitivity to light (photophobia). A serious allergic reaction to this drug is unlikely, but seek immediate medical attention if it occurs. Symptoms of a serious allergic reaction include: rash, itching/swelling (especially of the face/tongue/throat), dizziness, trouble breathing. This is not a complete list of possible side effects. If you notice other effects not listed above, contact your doctor or pharmacist. In the US - Call your doctor for medical advice about side effects. You may report side effects to FDA at 1-800-FDA-1088. In Canada - Call your doctor for medical advice about side effects. You may report side effects to Health Canada at 1-866-234-2345. PRECAUTIONS: Before taking phenelzine, tell your doctor or pharmacist if you are allergic to it; or if you have any other allergies. This product may contain inactive ingredients, which can cause allergic reactions or other problems. Talk to your pharmacist for more details. This medication should not be used if you have certain medical conditions. Before using this medicine, consult your doctor or pharmacist if you have: a certain kind of adrenal gland tumor (pheochromocytoma), cerebrovascular disease (e.g., stroke), heart problems (e.g., congestive heart failure, heart attack), high blood pressure, history of severe/frequent headaches, liver problems, severe kidney disease. Before using this medication, tell your doctor or pharmacist your medical history, especially of: personal/family history of mental/mood disorders (e.g., schizophrenia, bipolar disorder), family history of high blood pressure, heart disease (e.g., coronary artery disease, history of chest pain), mild/moderate kidney disease, diabetes, certain nervous system diseases (Parkinson's syndrome, seizures), overactive thyroid (hyperthyroidism). This drug may make you dizzy or drowsy. Do not drive, use machinery, or do any activity that requires alertness until you are sure you can perform such activities safely. Avoid alcoholic beverages. To minimize dizziness and the risk of fainting, get up slowly when rising from a sitting or lying position. Before having surgery or any procedures requiring use of contrast dye (e.g., myelography), tell your doctor or dentist you are on this medication. You may need to stop taking this drug beforehand. Follow your doctor's instructions carefully. If you have heart disease, this medication may mask chest pain. Avoid strenuous exercise while taking this medication. If you have diabetes, phenelzine may lower your blood sugar levels. Check your blood sugar regularly, and share the results with your doctor. Tell your doctor immediately if you have symptoms of low blood sugar such as cold sweat, shaking, rapid heart rate, fainting, and hunger. Your anti-diabetic medication or diet may need to be adjusted. Caution is advised when using this drug in the elderly because they may be more sensitive to the effects of the drug, especially the effects on blood pressure. This medication should be used only when clearly needed during pregnancy. Discuss the risks and benefits with your doctor. It is not known whether this drug passes into breast milk. Consult your doctor before breast-feeding. DRUG INTERACTIONS: Your healthcare professionals (e.g., doctor or pharmacist) may already be aware of any possible drug interactions and may be monitoring you for them. Do not start, stop or change the dosage of any medicine before checking with them first. This drug should not be used with the following medications because very serious (possibly fatal) interactions may occur: other antidepressants (e.g., nefazodone, SNRIs such as duloxetine/venlafaxine, SSRIs such as citalopram/fluoxetine/paroxetine, TCAs such as amitriptyline/nortriptyline), appetite suppressants (e.g., diethylpropion, sibutramine), drugs for attention deficit disorder (e.g., atomoxetine, methylphenidate), certain antihistamines (azatadine, carbetapentane, chlorpheniramine), bupropion, buspirone, carbamazepine, cyclobenzaprine, dextromethorphan, certain drugs for glaucoma (e.g., apraclonidine, brimonidine), certain drugs for high blood pressure (e.g., guanethidine, methyldopa), other MAO inhibitors (isocarboxazid, linezolid, methylene blue, moclobemide, procarbazine, rasagiline, selegiline, tranylcypromine), certain narcotic medications (e.g., fentanyl, meperidine), certain drugs for Parkinson's (e.g., entacapone, levodopa, tolcapone), street drugs (e.g., MDMA/"ecstasy", LSD, mescaline), stimulants (e.g., amphetamines, cocaine, dopamine, epinephrine, phenylalanine), tetrabenazine, "triptan" migraine drugs (e.g., sumatriptan, rizatriptan), tramadol, tyrosine, tryptophan. If you are currently using any of these medications listed above, tell your doctor or pharmacist before starting phenelzine. Do not take these medications within the 2 weeks before, during or after treatment with phenelzine. If you have been taking fluoxetine, wait at least 5 weeks after stopping fluoxetine before starting phenelzine. Discuss with your doctor how much time to wait between starting or stopping any of these drugs and taking phenelzine. Before using this medication, tell your doctor or pharmacist of all prescription and nonprescription/herbal products you may use, especially of: drugs for high blood pressure (e.g., beta blockers such as atenolol, clonidine, rauwolfia alkaloids such as reserpine, "water pills"/diuretics such as hydrochlorothiazide). Also report the use of drugs which might increase seizure risk (decrease seizure threshold) when combined with phenelzine such as isoniazid (INH), phenothiazines (e.g., thioridazine), theophylline, or tricyclic antidepressants (e.g., imipramine) among others. Consult your doctor or pharmacist for details. Tell your doctor or pharmacist if you also take drugs that cause drowsiness such as: certain antihistamines (e.g., diphenhydramine), anti-seizure drugs (e.g., phenytoin), medicine for sleep or anxiety (e.g., alprazolam, diazepam, zolpidem), muscle relaxants, narcotic pain relievers (e.g., codeine), psychiatric medicines (e.g., chlorpromazine, lithium, risperidone, trazodone). Check the labels on all your medicines (e.g., allergy, cough-and-cold products, decongestants, diet pills) because they may contain dextromethorphan, decongestants, stimulants, or drowsiness-causing ingredients. Ask your pharmacist about the safe use of those products. It is very important that you follow special dietary restrictions in order to limit the amount of tyramine in your diet. Avoid drinking large amounts of beverages containing caffeine (coffee, tea, colas) or eating large amounts of chocolate. Caffeine can increase the side effects of this medication. Foods and beverages high in tyramine should be avoided while you are taking this medication and for at least 2 weeks after you stop using this medication. Foods high in tyramine include: aged cheeses (cheddar, camembert, emmenthaler, brie, stilton blue, gruyere, gouda, brick, bleu, roquefort, boursault, parmesan, romano, provolone, liederdranz, colby, edam), aged/dried/fermented/salted/smoked/pickled/processed meats and fish (includes bacon, summer sausage, liverwurst, hot dogs, corned beef, pepperoni, salami, bologna, ham, mortadella, pickled or dried herring), banana peel, beef/chicken liver (stored, not fresh), bouillon cubes, commercial gravies, concentrated yeast extracts, fava beans, Italian green beans, broad beans, fermented bean curd, homemade yeast-leavened bread, kim chee (Korean fermented cabbage), orange pulp, overripe or spoiled fruits, packaged soups, red wine, sauerkraut, sherry, snow pea pods, sourdough bread, soy sauce, soybeans, soybean paste/miso, tofu, tap beer and ale, vermouth. Moderate-to-low tyramine content foods include: alcohol-free beer, avocados, bananas, bottled beer and ale, chocolate and products made with chocolate, coffee, cola, cultured dairy products (e.g. buttermilk, yogurt, sour cream), distilled spirits, eggplant, canned figs, fish roe (caviar), green bean pods, pate, peanuts, port wine, raisins, raspberries, red plums, spinach, tomatoes, white wine. Tell your doctor or pharmacist immediately if you notice symptoms of high blood pressure such as fast/slow heartbeat, vomiting, sweating, headache, chest pain, sudden vision changes, weakness on one side of the body, or slurred speech. Contact your healthcare professionals (e.g., doctor, pharmacist, dietician) for more information, including recommendations for your diet. This document does not contain all possible interactions. Therefore, before using this product, tell your doctor or pharmacist of all the products you use. Keep a list of all your medications with you, and share the list with your doctor and pharmacist. NOTES: Do not share this medication with others. Laboratory and/or medical tests (e.g., blood pressure, liver function) should be performed periodically to monitor your progress or check for side effects. Consult your doctor for more details.